Bekasi (Indonesian: Kota Bekasi) is a city in West Java, Indonesia, located on the eastern border of Jakarta within the Jabodetabek metropolitan region, as such it serves as a dormitory and factory city for Jakarta. The borders for this city are Bekasi Regency at the north, Bogor Regency and Depok City at the south, at the west is East Jakarta, at the east is Bekasi Regency. It is Indonesia's most populated incorporated suburban city to Jakarta, and one of the most populated worldwide, but still trails the likes of Incheon and Yokohama. The large number of multinational companies, has apparently attracted a lot of expatriates (mainly Japanese and Korean) to settle in Bekasi. It has an area of 210.49 square kilometres (81.27 sq mi) and had 2,663,011 people in 2014. The 2010 population was 2,378,211, making it Indonesia's fourth largest city, and second in West Java only to Bandung. 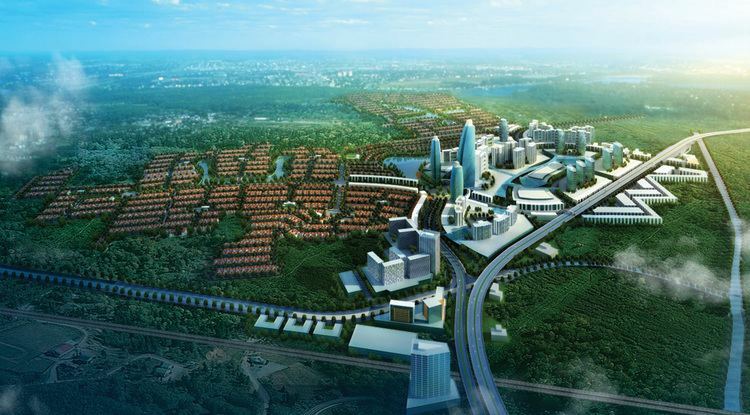 Many middle-up satellite cities have been developed in Bekasi, complete with their own shopping malls, schools, club houses, water park, and shuttle bus services to central Jakarta. Substantial urban areas surround the city. It serves as a commuter city for Jakarta, although it has notable trade, business and processing industries. These are primarily clustered in the area of Cikarang. Bekasi is one of the oldest cities in Indonesia, and has a history of being the capital city of the Kingdom of Tarumanagara. At that time, the name of Bekasi was Dayeuh Sundasembawa. The earliest evidence of its existence dates from the 5th century according to the Tugu inscription. In recent years, many residences have developed along the Jatibening/Cikunir — Tambun toll highway. These include Harapan Indah, Summarecon Bekasi, Kemang Pratama, Grand Galaxy City, and Grand Wisata. There are several shopping centers in Bekasi. The largest is Grand Metropolitan with over 125,000 m² of floor space. Other shopping centers include: Mega Bekasi Hypermall, Summarecon Mall Bekasi, Metropolitan Mall, Grand Galaxy Park, Grand Mall, Blue Oasis City, Bekasi Trade Centre, Bekasi Cyber Park, Mal Ciputra Cibubur, Plaza Pondok Gede, and Bekasi Square. Many hotels developed in Bekasi, such as Santika, Horison, Harris, Aston Imperial, Amaris, Amaroossa, and Tune Hotel. Bekasi is connected by the Trans-Java Highway, the main road across Java. There are two highway connections from the Jabodetabek urban area. The first is the Jakarta–Cikampek Toll Road, which has four exits in Bekasi. The other is the Jakarta Outer Ring Road, which provides access to Tangerang, Jakarta, and Bogor. Owing to its location as a satellite city of Jakarta, heavy rush hour traffic jams have become common on the roads between East Jakarta and Bekasi. Efforts have been made to overcome these problems, mainly by widening the roads between Sumber Arta and Bekasi Cyber Park along the Kalimalang river. The most recent traffic project is the constructing Becakayu toll road, which will be an alternate to the Jakarta-Cikampek Toll Road. Its route will be West Bekasi-Cawang-Kampung Melayu. Commuter train KAI Commuter Jabotabek, serves from Bekasi to Jatinegara–Manggarai–Jakarta Kota vice versa. The government is currently constructing a double track railway connecting Manggarai to Cikarang, which would be finished around 2017. The government proposed to build a 17.9 km light rail transit line connecting East Bekasi-Cawang-Dukuh Atas across Greater Jakarta. The TransJakarta serves commuters from Harapan Indah as well as feeder buses from Kemang Pratama and Grand Galaxy City. The Central Government decided to give fund for 6 Bekasi's feeders of TransJakarta. All the routes will end at Kampung Rambutan Terminal, East Jakarta from Kebon Paya Ampera (2 routes), Bulak Kapal, Bekasi Trade Center (2 routes) and Joyo Martono street. Damri shuttle bus service is available from the Soekarno–Hatta International Airport to Kayuringin, Harapan Indah, and Summarecon Bekasi. Taxis are widely available. The primary means of public transportation is by minibus, called Koasi. They serve certain routes throughout the city. The main bus terminal is Terminal Bekasi (located in East Bekasi). The other terminal are Pondok Gede and Kayuringin. In addition to its numerous residential areas, there are several important industrial areas in the outskirts of Bekasi. These include the Jababeka, MM 2100, Bekasi International Industrial Estate (BIIE), Delta Silicon Industrial Park, Lippo Cikarang, Greenland International Industrial City (GIIC) and East Jakarta Industrial Park (EJIP) districts. Many large companies, such as Honda, LG, Converse and Samsung, have factories in Bekasi. Nowadays some 4,000 companies are operating in Bekasi and surrounding areas. It is estimated that approximately 1,000 expatriate workers and over 500,000 laborers are working in the area. Hankook Tire of South Korea is building a US$353 million tire plant in Bekasi and started production in 2014. The latest official (2014) of Bekasi population was 2,663,011, giving a density of 11,900/km2 (31,000/sq mi). Bekasi is inhabited by many different ethnic groups, mostly Betawi and Javanese descent. Sundanese are the largest minority as well as other minorities include Minangkabau, Bataks, and Chinese. Most citizens in Bekasi adhere to Islam. Other religions include Christianity (Roman Catholicism and Protestantism), Hinduism, Buddhism, and Confucianism. Chairil Anwar's poem Krawang-Bekasi (1948). Pramoedya Ananta Toer's novel Di Tepi Kali Bekasi (1951) is set mainly in Bekasi.